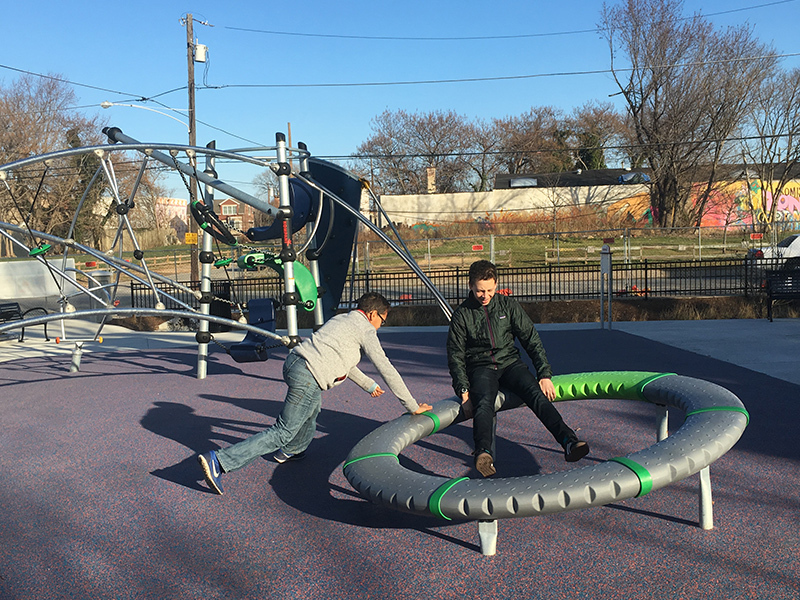 After years of neglect, the Trust for Public Land has completed the transformation of the aging Philadelphia Parks and Recreation site at 37th and Mt. Vernon. Now a vibrant community green space, Mantua residents have new opportunities to exercise, play, and engage with friends and neighbors. Designed so that parents and caregivers can sit and watch their children play, the upper portion of the site, formerly the basketball court, now hosts new play equipment and safety surfacing. New benches and picnic tables provide places for interaction. A rain garden, installed to help prevent rain water from entering the city sewers, provides a lush planted edge along 37th Street. Canopy trees have been installed to provide future shade. The basketball court has been relocated to the lower portion of the site, with updated lighting and new basketball standards. Spectators and teams can socialize sitting on the two-tiered seat wall as they watch the players. Completed in December 2016, the community is now enjoying its safe and beautiful space for recreation and conversation at 37th and Mt. Vernon playground.